Hey party people!! I am so excited to post this fantabulous giveaway today. 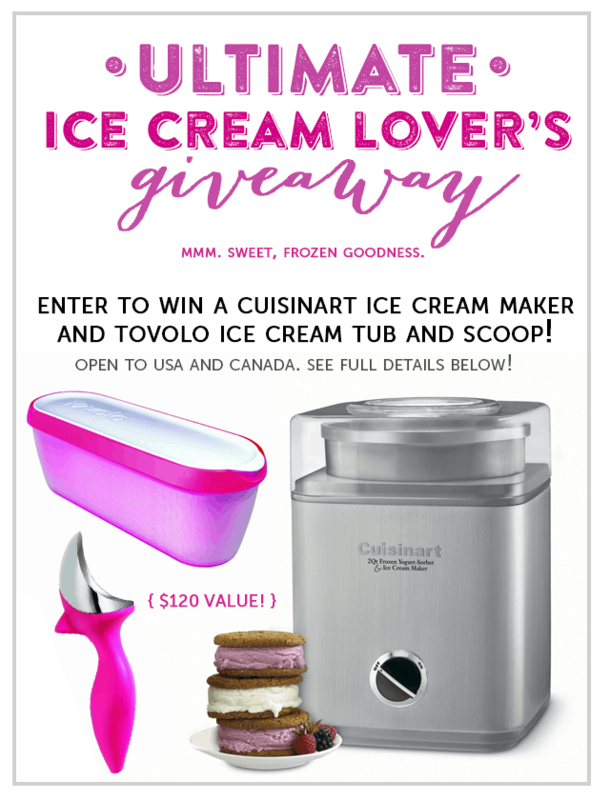 I’ve teamed up with a handful of bloggers and am offering a Cuisinart Ice Cream Maker and Tovolo Prize Pack! It’s valued at over $120. Woo hoo!! The summer is right around the corner and these items are SO PERFECT for the season. Have you ever made your own ice cream before? I’ve always wanted to try it. Who Am I Doing This Amazing Giveaway With? To enter, simply use the widget below. There are a few different ways you can earn an entry. Cool giveaway! Found it on twitter. I can’t enter this giveaway because Gleam isn’t working. All my instagram attempts are showing a popup saying Forbidden. Please tell the giveaway host to use a more proven tool. I like Gleam- it’s pretty-but it’s not scalable and definitely not ideal when it excludes people from being able to participate 🙁 so frustrating as I’d really like to enter.